I absolutely hated this story when I was young, says Anne. In fact, looking back, I see that I sorted all the fairy tales into those I adored (like The Twelve Dancing Princesses , Snow White , Puss in Boots and Cinderella ); and fairy tales I utterly despised. The little tailor was so stupid. Stupid to be bragging about killing seven flies already stuck fast in jam. Stupid to rescue a bird from a bush, then put it in his pocket. Stupid to squeeze the cheese so hard the whey dripped out. Stupid to tangle with a giant in the first place. But one of the things I have always loved most about this job is that you can turn anything you write into a technical challenge. So that's the way I've gone. I've told the story straight. But the reader does have to come to his or her own conclusion. Was he actually so truly resourceful and inventive that he deserved to win the great prize that becomes his at the end? Or was he just dead lucky all along? This author isn't telling. Read the book!. 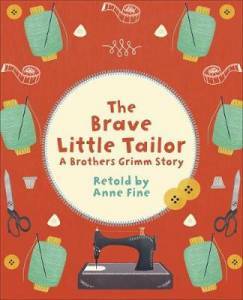 The Brave Little Tailor was published by Rising Stars on 22nd February 2019. Click the logo to order The Brave Little Tailor from . More fairy tales: read about Anne's version of The Twelve Dancing Princesses .